On Feb. 16th The RE Store salvage crew pulled materials from the former Community Food Co-op Connections building at the south end of the Forest Street Co-op’s parking lot. The whole building is currently being deconstructed by Bellingham-based Reuse Consulting – all to make way for more parking and a bike structure for the Co-op. 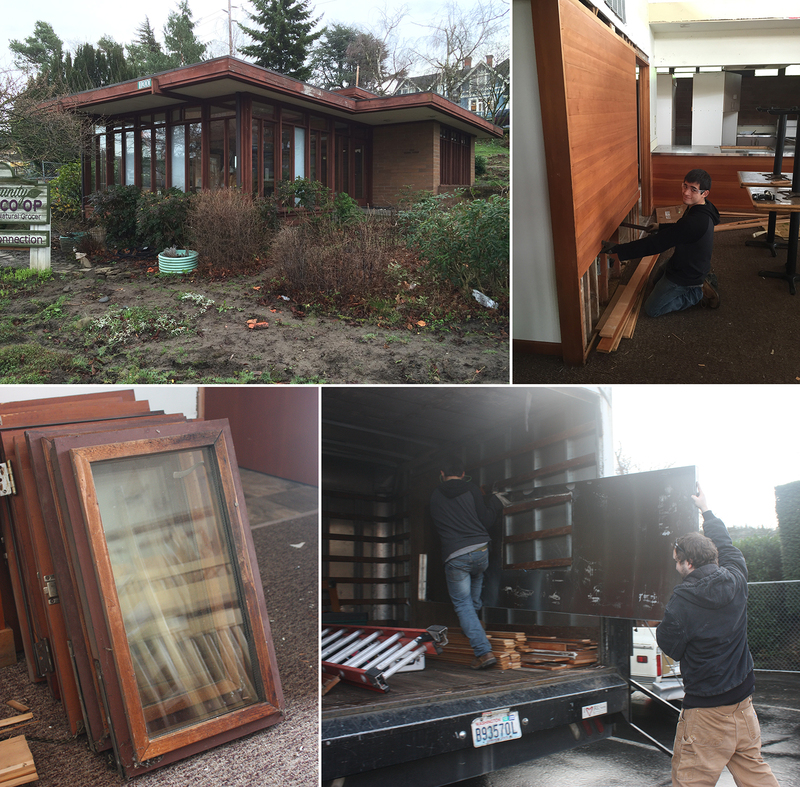 There was some strong interest in moving the beloved mid-century building as a whole, but some aspect of that plan did not work out with the City of Bellingham planning department, and thus the Co-op set out with the goal to have 95% of the materials be reused. Some materials will stay on site to create the new bike structure, while others will be used to create an event center off-site. The building was designed by Bellingham architect Jim Zervas, who studied under Frank Lloyd Wright and was a distinguished NW architect and planner for more than 50 years in the Bellingham and Whatcom County community. One of the finest examples of PNW mid-century architecture is being deconstructed to make way for the Food Co-op’s enlarged parking lot. James Zervas’ early ’60s Western Optical Building looked gorgeous from every angle, featured impeccable lines, and divine proportions. It was a lovely human-scale building that, like the best PNW architecture, brings the outside in, establishing a two-way relationship with the environment. It’s been in my life for a half century. I first noticed it when I was about four years old because it looked remarkably like my house on Chuckanut (the house I still live in) but was improbably placed in the middle of the city. I’ve had the pleasure of shopping for glasses there as a boy, leading a strategic planning session there for KCLT about ten years ago, and most recently, inspecting the original hand drawn plans at Dominique Zervas’ Bellingham law office. It was one of those classic PNW things, like a Salish Sea cobble beach, a Skagit Valley landscape painting, a crab feed with garlic butter, a Boundary Bay IPA, a live edge table by Smith + Vallee, a kayak in the rain, or a smoke-filled Waterfront Tavern. The RE Store salvage crew removed fir trim, windows, doors and stainless counters – all of which are in the store now. Come get a piece of this unique landmark for yourself!